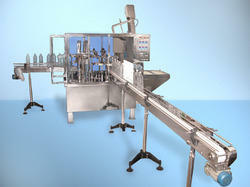 We are the manufacturers and trader of Bottle Filling Machines. we also manufacture various types of Bottle Filling Machines such as 24 BPM Bottle Filling Machine, 40 BPM Bottle Filling Machine, 60 BPM Bottle Filling Machine, 90 BPM Bottle Filling Machine. a) Motor 3 H.P. (1.1 k.w.) 1440RPM. - 440VAC. a) Motor 2 H.P. (1.1 k.w.) 1440RPM. - 440VAC. a) Motor 1.5 H.P. (1.1 k.w.) 1440RPM. - 440VAC. Bottle Washing Machine offered comes designed and developed using latest technology support and perfectly match up to the requirements of glass bottle washing and sterilization as demanded by the customers. 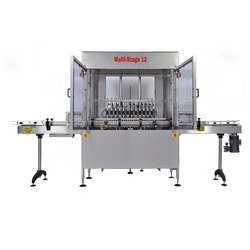 Further, the machine is designed to efficiently handle different shape bottles and provide for high energy savings in comparison to other available models. 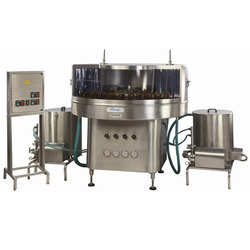 Some of its features include easy to operate; compact structure finish; conveyor support provided for easy bottle movement; ultrasonic washing for avoiding dead spots; crawler support to carry bottles; offering good cleaning effect and low bottle breakage rate.